C.1.8 Outline the different components of a web page. C.2.9 Describe the different metrics used by search engines. C.2.10 Explain why the effectiveness of a search engine is determined by the assumptions made when developing it. C.2.11 Discuss the use of white hat and black hat search engine optimization. C.4.1 Discuss how the web has supported new methods of online interaction such as social networking. What is the difference between scalability and elasticity? C.3.3 Distinguish between interoperability and open standards. C.3.4 Describe the range of hardware used by distributed networks. Save your original uncompressed images! C.3.6 Distinguish between lossless and lossy compression. C.3.7 Evaluate the use of decompression software in the transfer of information. A Filter Bubble Demonstration - Try this at home! Tech: The World Wide Web, also known as “www” is a part of the internet, using web browsers to share information across the globe via hyperlinks. Non-Tech: “WWW” is short for World Wide Web, and it uses browsers such as google chrome and firefox to access information online. It’s basically a software that allows us to connect to other people around the world. Internet is the global network of networks of computers. Internet is networks of computers, cables and wireless connections, which governed by Internet Protocol (IP), which deals with data and packets.World Wide Web, also known as the Web, is one set of software running on the Internet. Web is a collection of webpages, files and folders connected through hyperlinks and URLs.Internet is the hardware part, and Web is the software part. Therefore, Web relies the Internet to run, but not vice-versa. In addition to WWW other examples would include VoIP and Mail which have their own protocols and run on the internet. Many people label www and the internet as the same thing. However the internet is connecting many different computers together, giving people the ability to exchange data within one another, such as the news, pictures, or even videos. hardware or operator 2. WWW(world wide web) - operating system. The difference between Internet and WWW is that without internet their won't be a WWW. The WWW needs the internet to operate. A student in the United Kingdom is viewing a page from a newspaper’s website based in South Africa. (a) Using this example, distinguish between the internet and the World Wide Web. Many newspapers now host an internet version through which users can read the various news stories. Evolution of the web, different protocols and web technologies. Difference between static and dynamic web pages. External data sources. Role of the browser. The world wide web started around 1990/91 as a system of servers connected over the internet that deliver static documents, which are formatted as hypertext markup language (HTML) files, which support links to other documents, but also multimedia as graphics, video or audio. In the beginnings of the web, these documents consisted mainly of static information and text, where multimedia were added later. Some experts describe this as a “read-only web”, because users mostly searched and read information, while there was little user interaction or content contribution. The internet and thus the world wide web is constantly developing and evolving into new directions and while the changes described for the Web 2.0 are clear to us today, the definition for the Web 3.0 is not definitive yet. Continuing the read to read-write description form earlier, it might be argued that the Web 3.0 would be the “read-write-execute” web. One interpretation of this, is that the web enables software agents to work with documents by using semantic markup. This allows for smarter searches and the presentation of relevant data fitting into context. This is why Web 3.0 is sometimes called the semantic executive web. It’s about user input becoming more meaningful, more semantic, by users giving tags or other kinds of data to their document, that allow software agents to work with the input, e.g. to make it more searchable. The idea is to be able to better connect information that is semantically connected. However, it might also be argued that the Web 3.0 is what some people call the Internet of Things, which is basically connecting every day devices to the internet to make them smarter. In some way, this also fits the read-write-execute model, as it allows the user to control a real life action on a device over the internet. Either way, the web keeps evolving and the following image provides a good overview and an idea where the web is heading to. This is not visible on the page itself, but contains important information about it in form of metadata. The title goes inside the head and is usually displayed in the window top of the web browser. There are various types of meta tags, which can give search engines information about the page, but are also used for other purposes, such as to specify the charset used. The main part of the page document. This is where all the (visible) content goes in. Usually a collection of links that helps to navigate the website top of page or as hamburger on mobile. A hyperlink is a reference to another web page. Might be contained in a sidebar and is used for navigation and orientation within the website. Area at the top of a web page linking to other big topic areas. Usually used for a table of contents or navigation bar. A search engine is a program that allows a user to search for information normally on the web. The surface web is the part of the web that can be reached by a search engine. For this, pages need to be static and fixed, so that they can be reached through links from other sites on the surface web. They also need to be accessible without special configuration. Examples include Google, Facebook, Youtube, etc. The deep web is the part of the web that is not searchable by normal search engines. Reasons for this include proprietary content that requires authentication or VPN access, e.g. private social media, emails; commercial content that is protected by paywalls, e.g. online news papers, academic research databases; personal information that is protected, e.g. bank information, health records; dynamic content. Dynamic content is usually a result of some query, where data are fetched from a database. The most known search algorithms are PageRank and the HITS algorithm, but it is important to know that most search engines include various other factors as well, e.g. For the following description the terms “inlinks” and “outlinks” are used. Inlinks are links that point to the page in question, i.e. if page W has an inlink, there is a page Z containing the URL of page W. Outlinks are links that point to a different page than the one in question, i.e. if page W has an outlink, it is an URL of another page, e.g. page Z.
PageRank works by counting the number and quality of inlinks of a page to determine a rough estimate of how important the website is. The underlying assumption is that more important websites are likely to receive more links from other websites. As mentioned it is important to note that there are many other factors considered. For instance, the anchor text of a link is often far more important than its PageRank score. Links from site that are relevant carry more weight than links from non related sites. Based on the idea that keywords are not everything that matters; there are sites that might be more relevant even if they don’t contain the most keywords. It introduces the idea of different types of pages, authorities and hubs. Authorities: A page is called an authority, if it contains valuable information and if it is truly relevant for the search query. It is assumed that such a page has a high number of in-links. Hubs: These are pages that are relevant for finding authorities. They contain useful links towards them. It is therefore assumed that these pages have a high number of out-links. The algorithm is based on mathematical graph theory, where a page is represented by a vertex and links between pages are represented by edges (in form of vectors). Attempts to computationally determine hubs and authorities on a particular topic through analysis of a relevant subgraph of the web. Based on mutually recursive facts: Hubs point to lots of authorities. Authorities are pointed to by lots of hubs. A web crawler, also known as a web spider, web robot or simply bot, is a program that browses the web in a methodical and automated manner. For each page it finds, a copy is downloaded and indexed. In this process it extracts all links from the given page and then repeats the same process for all found links. This way, it tries to find as many pages as possible. Issue: A crawler consumes resources and a page might not wish to be “crawled”. For this reason “robots.txt” files were created, where a page states what should be indexed and what shouldn’t. Students should be aware that this is not always a transitive relationship. Meta Keywords Attribute - A series of keywords you deem relevant to the page in question. Title Tag - This is the text you'll see at the top of your browser. Search engines view this text as the "title" of your page. Meta Description Attribute - A brief description of the page. Meta Robots Attribute - An indication to search engine crawlers (robots or "bots") as to what they should do with the page. In the past the meta keyword tag could be spammed full of keywords sometimes not even relevant to the content on the page. This tag is mostly ignored by search engines. The met description can sometimes be show in the results, but is not a factor in actual ranking. Robotics Tag : This is super important and can be sued to disallow crawlers from crawling the page, you can specify all crawlers or list the ones that you do not wish to be crawled by. According to a study released in October 2000, the directly accessible "surface web" consists of about 2.5 billion pages, while the "deep web" (dynamically generated web pages) consists of about 550 billion pages, 95% of which are publicly accessible [LVDSS00]. By comparison, the Google index released in June 2000 contained 560 million full-text-indexed pages [Goo00]. In other words, Google — which, according to a recent measurement [HHMN00], has the greatest coverage of all search engines — covers only about 0.1% of the publicly accessible web, and the other major search engines do even worse. Increasing the coverage of existing search engines by three orders of magnitude would pose a number of technical challenges, both with respect to their ability to discover, download, and index web pages, as well as their ability to serve queries against an index of that size. (For query engines based on inverted lists, the cost of serving a query is linear to the size of the index.) Therefore, search engines should attempt to download the best pages and include (only) them in their index. It downloads multiple pages (typically 500) in parallel. This modification allows us to download about 10 million pages a day; without it, we would download well under 100,000 pages per day. Only a single HTTP connection is opened to any given web server at any given time. This modification is necessary due to the prevalence of relative URLs on the web (about 80% of the links on an average web page refer to the same host), which leads to a high degree of host locality in the crawler's download queue. If we were to download many pages from the same host in parallel, we would overload or even crash that web server. If it took t seconds to download a document from a given web server, then Mercator will wait for 10t seconds before contacting that web server again. This modification is not strictly necessary, but it further eases the load our crawler places on individual servers on the web. We found that this policy reduces the rate of complaints we receive while crawling. Search engines index websites in order to respond to search queries with relevant information as quick as possible. For this reason, it stores information about indexed web pages, e.g. keyword, title or descriptions, in its database. This way search engines can quickly identify pages relevant to a search query. Indexing has the additional purpose of giving a page a certain weight, as described in the search algorithms. This way search results can be ranked, after being indexed. Relevancy does your site provide the information the user is searching for. The user experience (UX) is becoming a big part as this can not be manipulated and in the future will play a much bigger role. User Experience ( time user stays on site / bounce rate ). Many factors play a role in the user experience. Load Speed, Easy Navigation ( no broken links ), Spelling, quality and factually correct content, Structured layout 5 Use of images/video 5 page design colors, images video infographics and formatting so it is easy to scan the page for relevant information. The idea is to get the user to stay on your site ( sticky ) . If a use lands on your site after do a search and leaves after a few seconds sends or even before the page loads ( slow loding ) the is a very BIG signal to google that they should not have served up that result. Back Links from other web site the more authoritative the site the better ( example huffington post ), The site that links to your site should also be relevant. Example if your selling dog insurance a site from a respected charitable dog web site would be a very big boost. A link from a site that provides car rental would have little impact as totally irrelevant. Social media marketing FACE Book etc. Be a leader in your field and comment on relevant authoritative forums or blogs. Others users sharing via social bookmarking sites. This an area in which you can manipulate the search results. If Google discovers this your web site will be dropped from index. So need to ensure any links are natural linking to an authoritative article info graphic on your web site. The process of making pages appear more prominently in search engine results is called SEO. There are many different techniques, considered in section C.2.11. This field is a big aspect of web marketing, as search engines do not disclose how exactly they work, making it hard for developers to perfectly optimise pages. In order to improve the ranking of a web site Google uses many many metrics below is a few of the important ones. If link broker browser will return a HTTP response code 404. This should be detected by web designer and provide a help page with user navigation. The search engine must serve up results that are relevant to what the users search for, Google used page rank , prior to that search engines just used title tags key word tags. These could be easily manipulated ( stuffed with keywords that you wish to rank for ) to get your site on page 1. Google devised a Page Rank checking algorithm which played a big part of their search algorithm. Determine sites that change on a regular basis and cache these. The spider should not overload servers by continually hitting the same site. Use comments box to add more or question why these. Definition: Black hat SEO is a technique, in simple words, to get the top positions or higher rankings in the major search engines like Google, Yahoo and Bing that breaks the rule and regulations of search engine’s guidelines. See example of guidelines for google click he﻿﻿﻿﻿﻿re. This worked at one time, now you still need the key words / search terms in your title and page content you need to ensure that you do not overuse the keywords / phrases as that will trip a search engine filter. Google ( currently ) favors older sites, sites with history. In this approach you buy an expired domain with good metrics , build it up and add links to your sites giving a boost in ranking. This works, but it is costly to set set up and you need to use alias etc. Similar to PBN the aim is to get good quality links from high authority sites. Have a look at Fiverr where yo can buy such links. This is difficult for google to detect and it is also very effective. Search engines evaluate the content of a web page, thus a web page might get higher ranking with more information. This will make it more valuable on the index and other web pages might link to your web page if it has a high standard in content. Good menu navigation. Proper use of title tags and header tags, adding images with keyword alt tags, interlinking again with keyword anchor text. Create a, sitemap to get site crawled plus inform the spiders how often to visit site. This a broad term and overlaps some other areas mentioned example page load speed. The purpose to ensure that if a use click to go to your site they stay without clicking back to the serps immediately. Google is happy as this a quality signal as its main purpose to provide the user with relevant results. Provide fresh content on a regular basis. Google is continually ( as are other search engines ) fighting black hat techniques that web masters employ to rank high in the serps. Investigate these 2 major algorithm updates Panda and Penguin. A good example of a current black hat practice is the use of PBN's. Students to investigate PBN's Panda and Penguin Quick discussion on these and what Google was targeting and how PBN's are currently being used effectively to rank sites higher ( if caught you will wake up one morning and you web site(s) have been de-indexed from Google. Search engines must be fast enough to crawl the exploding volume of new Web pages in order to provide the most up-to-date information. As the number of pages on the Web grows, so will the number of results search engines return. So, it will be increasingly important for search engines to present results in a way that makes it quick and easy for users to find exactly the information they’re looking for. Search engines have to overcome both these challenges. Use of natural language process will also become more prevalent. Today, the search engine takes a set of keywords as the input and returns a list of rank-sorted links as the output. This will slowly fade and the new search framework will have questions as the input and answers as the output. The nascent form of this new framework is already available in search engines like Google and Bing. Personalized Search Because mobile is becoming the primary form of consumption, future search engines will try to use powerful sensing technologies like accelerometer, digital compass, gyroscope and GPS. Google recently bought a company called Behavio which predicts what a user might do next by using the information acquired from the different sensors on the user’s phone. successful companies that emerge at each stage of its evolution become monopolies market economics don’t apply. Abundantly available information can be placed in new contexts and reused in unanticipated ways. This is the dynamic that enabled the WWW to spread, as the value of Web documents was seen to be greater in information rich contexts (O’Hara & Hall, 2009). Students should be aware of issues linked to the growth of new internet technologies such as Web 2.0 and how they have shaped interactions between different stakeholders of the web. Google Maps is it free ? Should Google have a monopoly on location information? Are there Alternatives to Google Maps? It’s worth noting that this comparison is not about two opposites. Both concepts do not exclude each other and can complement one another. An application gets split into the client side and server-side. The server can be a central communicator between clients (e.g. email/chat server) or allow different clients to access and manipulate data in a database. A client-server application does also not necessarily need to be working over the internet, but could be limited to a local network, e.g. for enterprise applications. Pay per use: elasticity allows the user to only pay for the resources that they actually use. Using these services offers many advantages over the server client model : Can you think of some? In a private cloud model a company owns the data centers that deliver the services to internal users only. In a public cloud services are provided by a third party and are usually available to the general public over the Internet. Defined as the seclusion of information from others. In the context of the web this can relate to healthcare record, sensitive data from financial institutions, residential/geographic records, criminal justice investigations/proceedings. For such information it is essential to prevent unauthorized access. Defined as the process of claiming to be one’s identity. This process is important for privacy and is required for authentication. Process of proving/confirming one’s identification. Most usually done through a username-password combination, but other methods such as two-factor authentication become more and more prominent on the web. A common form of two-factor authentication requires the user to enter a code received by SMS in addition to the conventional password. Students should be aware of developments in mobile technology that have facilitated the growth of distributed networks. The primary web file formats are gif (pronounced “jiff”), jpeg (“jay-peg”), and, to a much lesser extent, png (“ping”) files. All three common web graphic formats are so-called bitmap graphics, made up of a checkerboard grid of thousands of tiny colored square picture elements, or pixels. Bitmap files are the familiar types of files produced by cell phone and digital cameras, and are easily created, edited, resized, and optimized for web use with such widely available tools as Adobe’s Photoshop or Elements, Corel’s Paint Shop Pro and Painter, and other photo editing programs. The CompuServe Information Service popularized the Graphic Interchange Format (gif) in the 1980s as an efficient means to transmit images across data networks. In the early 1990s the original designers of the World Wide Web adopted gif for its efficiency and widespread familiarity. Many images on the web are in gif format, and virtually all web browsers that support graphics can display gif files. gif files incorporate a “lossless” compression scheme to keep file sizes at a minimum without compromising quality. However, gif files are 8-bit graphics and thus can only accommodate 256 colors. The gif file format uses a relatively basic form of file compression (Lempel Ziv Welch, or lzw) that squeezes out inefficiencies in data storage without losing data or distorting the image. The lzw compression scheme is best at compressing images with large fields of homogeneous color, such as logos and diagrams. It is much less efficient at compressing complicated “photographic” pictures with many colors and complex textures (fig. 11.4). Figure 11.4 — The LZW compression built into the GIF graphic format is very good at efficiently saving diagrammatic graphics (right) but poor at compressing more complex photographic images (left). Full-color photographs can contain an almost infinite range of color values; gif images can contain no more than 256 colors. The process of reducing many colors to 256 or fewer is called dithering. With dithering, pixels of two colors are juxtaposed to create the illusion that a third color is present. Dithering a photographic image down to 256 colors produces an unpleasantly grainy image (fig. 11.5). In the past this technique was necessary to create images that would look acceptable on 256-color computer screens, but with today’s full-color displays there is seldom any need to dither an image. If you need a wider range of colors than the gif format can handle, try using your image editor to save the image in both jpeg and png formats (described below), compare the resulting file sizes and image qualities, and pick the best balance of file size and image quality. Figure 11.5 — Dithering a full-color photograph (left) to a 256-color image (right) results in an image with lots of visual noise and harsh transitions between pixels of different colors. Luckily, such color dithering compromises are now mostly a thing of the past, since most users now have “true color” monitors that can display thousands or millions of colors. You can take advantage of the characteristics of lzw compression to improve its efficiency and thereby reduce the size of your gif graphics. The strategy is to reduce the number of colors in your gif image to the minimum number necessary and to remove colors that are not required to represent the image. A gif graphic cannot have more than 256 colors, but it can have fewer. Images with fewer colors will compress more efficiently under lzw compression. For example, when creating gif graphics in Photoshop, don’t save every file automatically with 256 colors. A simple gif image may look fine at 8, 16, or 32 colors, and the file size savings can be substantial. For maximum efficiency in gif graphics, use the minimum number of colors that gives you a good visual result. The gif format allows you to pick colors from the color lookup table of the gif to be transparent. You can use image-editing software such as Photoshop (and many shareware utility programs) to select colors in a gif graphic’s color palette to become transparent. Usually the color selected for transparency is the background color in the graphic. Unfortunately, the transparent property is not selective; if you make a color transparent, every pixel in the graphic that shares that color will also become transparent, which can cause unexpected results. Adding transparency to a gif graphic can produce disappointing results when the image contains anti-aliasing. If you use an image-editing program like Photoshop to create a shape set against a background color, Photoshop will smooth the shape by inserting pixels of intermediate colors along the shape’s boundary edges. This smoothing, or anti-aliasing, improves the look of screen images by softening what would otherwise look like jagged edges. The trouble comes when you set the background color to transparent and then use the image on a Web page against a different background color. The anti-aliased pixels in the image will still correspond to the original background color. In the example below, when we change the background color from white to transparent (letting the gray web page background show through), an ugly white halo appears around the graphic (fig. 11.6). Figure 11.6 — The dreaded “white halo” in transparent GIF graphics. The same problem exists with printing. Most browsers do not print background colors, and a transparent gif anti-aliased against a colored background will not blend smoothly into the white of the printed page. The other graphic file format commonly used on the web to minimize graphics file sizes is the Joint Photographic Experts Group (jpeg) compression scheme. Unlike gif graphics, jpegimages are full-color images that dedicate at least 24 bits of memory to each pixel, resulting in images that can incorporate 16.8 million colors. 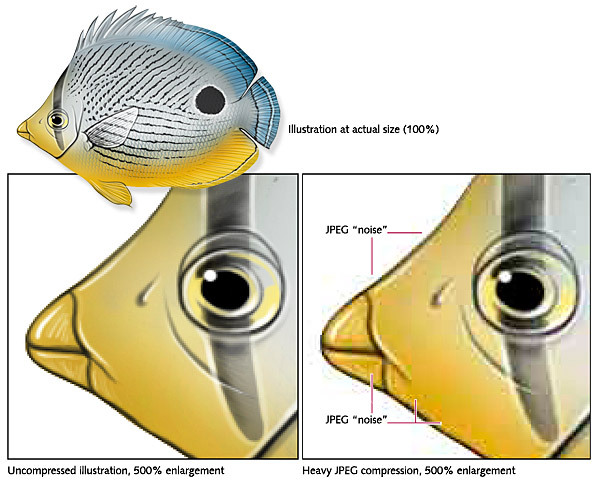 jpeg images are used extensively among photographers, artists, graphic designers, medical imaging specialists, art historians, and other groups for whom image quality and color fidelity is important. A form of jpeg file called “progressive jpeg” gives jpeg graphics the same gradually built display seen in interlaced gifs. Like interlaced gifs, progressive jpegimages often take longer to load onto the page than standard jpegs, but they do offer the user a quicker preview. jpeg compression uses a sophisticated mathematical technique called a discrete cosine transformation to produce a sliding scale of graphics compression. You can choose the degree of compression you wish to apply to an image in jpeg format, but in doing so you also determine the image’s quality. The more you squeeze a picture with jpeg compression, the more you degrade its quality. jpeg can achieve incredible compression ratios, squeezing graphics down to as much as one hundred times smaller than the original file. This is possible because the jpeg algorithm discards “unnecessary” data as it compresses the image, and it is thus called a “lossy” compression technique. Notice in figure 11.7 how increasing the jpegcompression progressively degrades the details of the image. The checkered pattern and the dark “noise” pixels in the compressed image are classic jpeg compression artifacts. Note the extensive compression noise and distortion present in the image below, particularly around the leading edge of the fish's head. Figure 11.7 — JPEG compression comes at a cost: a big increase in visual noise and other compression artifacts that degrade the image quality if over-used. Once an image is compressed using jpeg compression, data is lost and you cannot recover it from that image file. Always save an uncompressed original file of your graphics or photographs as backup. If your digital camera produces jpeg images, set aside the “camera original” jpeg files and work with copies when you edit the files for web use. Each time you save or resave an image in jpeg format, the image is compressed further and the artifacts and noise in the image increase. Portable Network Graphic (png) is an image format developed by a consortium of graphic software developers as a nonproprietary alternative to the gif image format. As mentioned above, CompuServe developed the gif format, and gif uses the proprietary lzw compression scheme, which was patented by Unisys Corporation, meaning that any graphics tool developer making software that saved in gif format had to pay a royalty to Unisys and CompuServe. The patent has since expired, and software developers can use the gif format freely. png graphics were designed specifically for use on web pages, and they offer a range of attractive features, including a full range of color depths, support for sophisticated image transparency, better interlacing, and automatic corrections for display monitor gamma. png images can also hold a short text description of the image’s content, which allows Internet search engines to search for images based on these embedded text descriptions. png supports full-color images and can be used for photographic images. However, because it uses lossless compression, the resulting file is much larger than with lossy jpegcompression. Like gif, png does best with line art, text, and logos—images that contain large areas of homogenous color with sharp transitions between colors. Images of this type saved in the png format look good and have a similar or even smaller file size than when saved as gifs. However, widespread adoption of the png format has been slow. This is due in part to inconsistent support in web browsers. In particular, Internet Explorer does not fully support all the features of png graphics. As a result, most images that would be suitable for png compression use the gif format instead, which has the benefit of full and consistent browser support. It takes time to decompress and if an urgent short message this could be viewed as a downside. Text ? How is text stored on computer ? Lossless ( Preserves all information ) can be used in ? Lossy ( redundant information removed ) can it be used for text ? Better Than 33 Bits How? How can we compress hello world to less than 33 bits? For the letters that occur the must assign less bits than the letters that are less frequent. How do we decode ? Is it ambiguous? What makes this approach ambiguous ? How can we compress text ? The storage capacity of computers is growing at an unbelievable rate—in the last 25 years, the amount of storage provided on a typical computer has grown about a millionfold—but we still find more to put into our computers. Computers can store whole books or even libraries, and now music and movies too, if only they have the room. Large files are also a problem on the Internet, because they take a long time to download. We also try to make computers smaller—even a cellphone or wristwatch can be expected to store lots of information! Huffman coding is a lossless data compression algorithm. The idea is to assign variable-length codes to input characters, lengths of the assigned codes are based on the frequencies of corresponding characters. The most frequent character gets the smallest code and the least frequent character gets the largest code. The variable-length codes assigned to input characters are Prefix Codes, means the codes (bit sequences) are assigned in such a way that the code assigned to one character is not prefix of code assigned to any other character. This is how Huffman Coding makes sure that there is no ambiguity when decoding the generated bit stream. Let us understand prefix codes with a counter example. Let there be four characters a, b, c and d, and their corresponding variable length codes be 00, 01, 0 and 1. This coding leads to ambiguity because code assigned to c is prefix of codes assigned to a and b. If the compressed bit stream is 0001, the de-compressed output may be “cccd” or “ccb” or “acd” or “ab”. Investigate LEMPEL-ZIV CODING , you just need a high level understanding of how it works. State 2 text , 2 graphic and 2 video compression techniques. Also explain the importance of compression now and in the future. In theory the world wide web should be a free place where anybody can have a website. However, hosting a website usually comes with a cost - registering a domain name, getting a hosting service or investing in servers oneself, creating and maintaining the website (requires technical knowledge or the cost of hiring a web developer). In addition, to reach an audience further marketing through SEO (see C.2) is usually necessary to get good rankings in search engine results. This means that for the normal individual a traditional website is not the best option. A better alternative is to publish content on an existing platform, e.g. micro blogging on Twitter, blogging on WordPress or Blogspot, sharing social updates on Facebook, sharing photos on Flickr, etc. . This comes with improved comfort for users. However, it easily leads to unregulated monopolies in the market because users usually stick to one platform. Tim Berners-Lee describes today’s social networks as centralized silos, which hold all user information in one place. This can be a problem, as such monopolies usually control a large quantity of personal information which could be misused commercially or stolen by hackers. There are certainly many more concerns which won’t fit into the scope of this site. One way to see how filter bubbles work with search engines that do personalization (like Google) is to take a word that can have multiple meanings in different contexts and build up different search histories using those contexts. Then, when you search for the same word after having built up different search histories, the search engine should return results that look a bit different. For this demonstration to work, you need to be sure to clear your search history before you start each round. This works even better if you have 2 or 3 people working side by side at different computers. That way you can compare the results more easily. Try this with the word Tea. 1. Have someone build a search history using names of countries where tea is popularor names of countries where teas orgininated. Remember, do not use the word "tea" as a search term quite yet. Examples would be England, Japan, China, Latin America, etc. 2. Have another person build a search history using different spices, herbs, and flowersthat make up common teas. Examples would be roses, cinammon, chrysanthemum, lavender, etc. 3. Have a third person search for anything related to politics, such as names of political parties (not the Tea Party just yet, though! ), names of political movements, words like "activism," or "conservative" and "liberal." 4. When you are performing these searches, click on some of the results (preferably general ones that might somehow later be connected to tea!). This will contribute to your search history. 5. Finally, have everyone search for the word "Tea." Have fun comparing results! Note: Your results may still look very similar; the differences may be subtle. Whether or not the filter bubble is really something to be concerned about will be discussed in the next tab.